How to Make a Whole Chicken in the Instant Pot: In less than 60 minutes, you can have a tender, perfectly roasted chicken made in your electric pressure cooker. 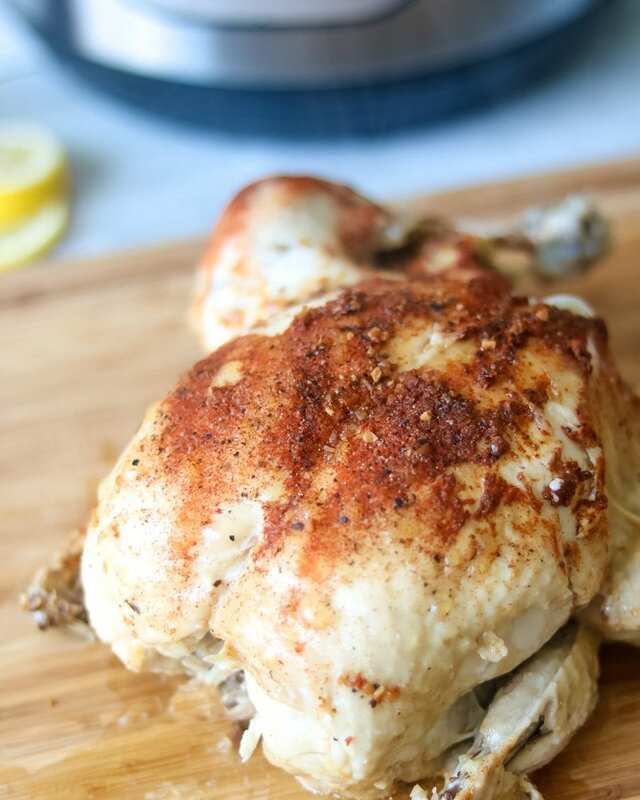 This easy chicken recipe is flavored with a homemade rotisserie seasoning and is perfect for eating for an easy dinner or using in chicken recipes. Raise your hand if you are a fan of Ina Garten? I can’t imagine any of you would not have your hand raised high. Ina is the queen of simple recipes that always turn out spectacularly. She is also the queen of roasted chicken recipes. Ina must be rubbing off on me, because my chicken game is on point–and you guys seem to becoming to me more and more for easy chicken recipes. I have mastered cooking chicken breasts in the instant pot, homemade rotisserie chicken, and slow cooker chicken drumsticks just to name a few. But of course those are just the basic chicken recipes–I love making more complicated chicken dishes like Chicken Marsala, Pretzel Chicken Cordon Bleu and Buffalo Chicken Tacos. Want to know what else you guys are begging for me to create? 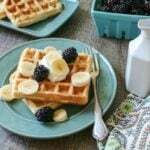 More Instant Pot Recipes! And so I predict this Instant Pot Rotisserie Style Chicken is going to quickly become a new favorite recipe at your house. I held off making a whole chicken in the pressure cooker for a long time. I felt like I already had a great recipe for Oven Rotisserie Chicken, so why mess with a good thing? Well, I am glad I decided to start experimenting, because rotisserie chicken in the pressure cooker is about the best thing since sliced bread. Instant pot whole chicken is tender, incredibly moist and perfectly cooked. I could not get over how juicy the meat was after pressure cooking. You can see the meat pulling away from the bones as the whole chicken was tenderized as it cooked. My son actually asked me if I brined the chicken first because it was so incredibly flavorful and juicy. And yes, being the child of a food blogger, my son knows all about brining meat! Step one: Make sure your chicken fits into your instant pot. Don’t laugh! If your chicken is larger than your pressure cooker you will be cursing up a storm you can’t make Instant Pot Roasted chicken–if your chicken does not fit into your pressure cooker just use my oven roasted chicken recipe. I have a 6 quart Instant Pot and I have made as large as a 5 1/2 pound whole chicken. And this is the time, when you can refer to Max fill line on your instant pot. If you remember, in my Instant Pot 101, I told you not to fill more than 2/3 full when pressure cooking–this is the exception to that rule. Step Two: Place your trivet into your pressure cooker and pour in 1 cup water–you need liquid in order for pressure to build and pressure cooking to be possible. If you have an 8 quart instant pot–use 2 cups water. Step Three: Stuff your cleaned chicken with an onion and lemon. And by cleaned, I mean clean out your gizzards, etc from inside your chicken–do not rinse your chicken. You can read more about why you shouldn’t rinse your chicken here. Step Four: Place your chicken into your instant pot and season with the homemade rotisserie rub. Step Six: Allow pressure to naturally release for at least 10 minutes (I prefer 20-25 minutes for more tender meat) and then remove chicken for serving. Step Seven: Save bones from your roasted chicken to make Instant Pot Chicken Stock. The length of cooking time for whole chickens will vary based on size of your chicken. A safe rule of thumb is to cook your chicken 6 minutes per pound and let naturally release for at least 20 minutes for perfectly cooked chicken. Can you cook a whole chicken that is frozen in the instant pot? You CAN cook a whole frozen chicken in the Instant Pot if your frozen chicken already has the innards/gizzards removed and has no plastic ties around the feet. You will not be able to remove a plastic insert or bag of gizzards from a frozen chicken. Therefore, you can not put a frozen chicken with either of those items into your pressure cooker. If you have a chicken that comes without the gizzards or plastic clamp around the legs, you would need to increase time by 5 minutes per pound, for a total of 11 minutes per pound and for frozen chicken, let pressure release for at least 20 minutes. For each pound increase by 11 minutes, for each half a pound increase by 6 minutes for frozen whole chickens. Can I make chicken stock while cooking a whole chicken in the electric pressure cooker? Yes, you can make stock at the same time as cooking a whole chicken in your instant pot–with a few cautions. First of all, your skin will NOT be able to be crisped up, as the whole chicken will cook submerged in liquid. You will need to cook a smaller chicken, as you do not want to exceed filling your pressure cooker more than 2/3 of the way full. You will not need to use your trivet if making a whole chicken and stock at the same time. Omit rotisserie seasoning, so your chicken broth is not overly salty. Your chicken stock will be more greasy as the skin will render quite a bit of fat while cooking. You will need to allow chicken stock cooked with a whole chicken to naturally release pressure on it’s own, as when pressure cooking this much liquid, it would be dangerous to release the pressure prematurely. I recommend making Instant Pot Whole Chicken as this recipe suggests and then following my recipe for Instant Pot Chicken Stock with the leftover carcass from your chicken. But if you want to cook the whole chicken and make stock together, place your chicken into your instant pot, along 1 diced onion, 1 carrot, 1-2 stalks of celery and 2 teaspoons kosher salt. Cover with water and cook according to size of your whole chicken. Let pressure release naturally and then remove chicken and strain broth. Use cooked chicken and stock as desired. Does this roasted chicken for the instant pot have crispy skin? Cook the chicken as directed in your pressure cooker. After removing the chicken for your instant pot, transfer to a baking sheet. Brush with oil and place under broiler for 2-4 minutes, watching closely as to not burn the chicken. Yes, you can brine your chicken before cooking in your pressure cooker. Use your favorite brine recipe (or my Turkey brine recipe) and then omit salt from the seasoning blend. Cook as recipe states for a brined chicken. I don’t like the homemade rotisserie seasoning? What else can I use? If you don’t happen to like this rotisserie seasoning blend, you can simply sprinkle the chicken with salt and pepper or your favorite spice blend before cooking. Make a perfectly juicy rotisserie style chicken in your electric pressure cooker. This recipe is Gluten-Free, Paleo, Whole 30, Keto-Friendly and Sugar Free. Place trivet in instant pot pan and pour in 1 cup COLD water into instant pot. Use 2 cups water if you have an 8 quart instant pot. Place cut lemon and onion inside cavity of chicken and place chicken on trivet in instant pot. Sprinkle seasoning evenly over chicken. Place lid on pressure cooker and be sure valve is turned to sealed. Set on high pressure for 6 minutes per pound of chicken. If your chicken seems like it is really thick (the chicken breasts are large) you may want to increase time to 7 minutes per pound. A smaller organic chicken only needs 6 minutes per pound. Once cooking time is finished, allow pressure to release naturally for at least 10 minutes, preferably closer to 20 minutes. Be sure to allow pressure to naturally release for at least 10 minutes, preferably 20 minutes. If your chicken seems like it is really thick (the chicken breasts are large) you may want to increase time to 7 minutes per pound. A smaller organic chicken only needs 6 minutes per pound. Oh wow, i’ve never thought of cooking a how chicken in the instant pot before, but after reading this I’ll definitely be giving it a go!! I hope you do Chris–it is incredibly easy with huge delivery! Can you throw in some potatoes at the same time? Hi Natasha, It may be hard to fit the potatoes into the pressure cooker with the chicken.If there is room, keep in mind that potato chunks will cook faster than an entire chicken. They potatoes will be very soft after that cook time with all the moisture from the slow cooker as well. It works, just may not be ideal. 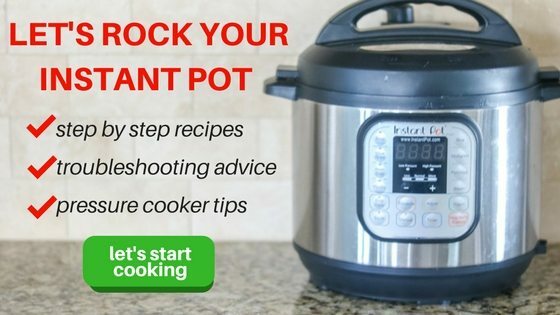 How can I get a cookbook for my instant pot? Don’t bother. I just cooked the whole chicken as per instructions and the breast meat was so dry I needed wash each mouthful down with water. The temp was 185, a bit too hot, but still, it should not have been that dry. I am sorry Tom this Chicken was so dry. If you did a quick release that could explain it. Mine turned out dry too, I went by the recipe I left the pressure come down for 20 min. Then quick released it I didn’t like the consistency of it either. What did I do wrong? Hi Carmen, I am sorry to hear that. I have had the exact opposite. Did you use cold water under your trivet? Did you add in any seasonings to cavity of the chicken? Also, was your chicken organic or on the leaner side–if so, it may have need slightly less cook time. Wow, who knew it was so easy! I bet this is better than the rotisserie chickens at the grocery store! Can’t wait to try this recipe out in my instant pot! Rebecca, It is so much better tasting AND better for you than what you find at any store! Literally drooling. That seasoning blend sounds amazing! It really knocks it out of the park in flavor! Julia, it is REALLY simple and quite delicious! Well all the Instant Pot lovers should like this easy and delicious recipe. No more store bought chicken. This would be so much better. That looks so delicious! I have yet to have purchased an insta-pot! I love a nice juicy chicken! Sometimes they get dry in the oven! 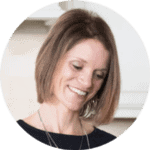 Beth, you really need to get an instant pot–they are AMAZING!! And this chicken is ANYTHING but dry! Luv this recipe! Now I need to get me an IP! LOL!! Thanks girl! Wouldn’t that be grand if Ina invited me over to show her my IP chicken?!! It would be a dream come true! And yes, you really do want to get an Instant Pot–they are amazing! I don’t have an Instant Pot yet, but I need to get one! That’s on my birthday list. I am constantly amazed at the cooking times. I can’t believe you can cook a frozen chicken in 55 minutes. Thanks for sharing all of this! I hope you have a great evening. 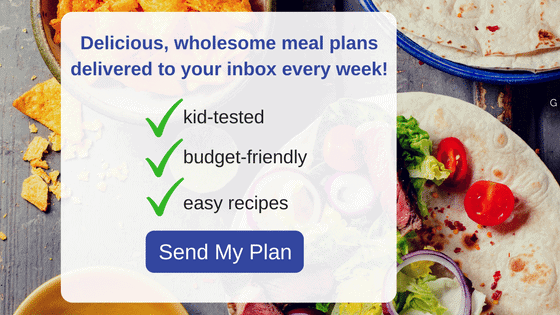 Julie, I hope you get an instant pot for your birthday–they really do make weeknight cooking a breeze. To quote my 4 year old daughter: “why is this chicken so soft and fluffy?”. Fluffy it was not, but soft and juicy it was! Yum. A good, solid, staple recipe. YAY! Instant Pot success and winner winner chicken dinner for your daughter! Thanks for sharing your success Lauren! I tried this recipe tonight and the chicken came out so moist and delicious. I like how the lemon adds flavor to the meat. Overall, dinner was a success! I love to help you buy a successful dinner on the table. So glad you enjoyed. Holy cow! Awesome recipe and awesome Instant Pot!! Hubby bought me a 6 qt IP yesterday, told him to bring home a whole chicken and he brought home a 9 lb chicken!! It fit! I was worried that it wouldn’t cook evenly since it totally filled the pot. I love my IP! The chicken turned out so moist and juicy, it was so tender that it fell apart as I pulled it out of the pot, and holy cow the stock it made is wonderful! I love that I chose the whole roasted chicken as my first dish. Thinking about maybe shredded chicken enchiladas with the left overs using a PIP method. 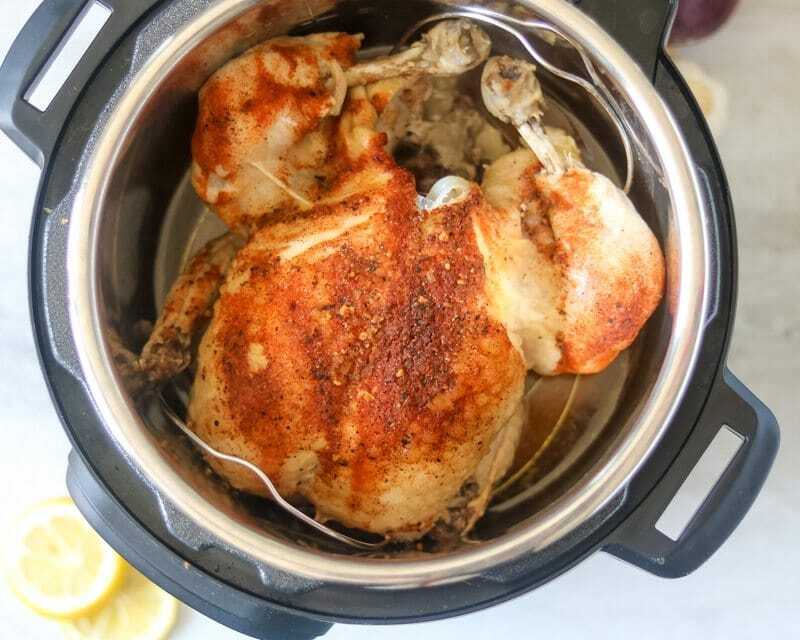 I absolutely love cooking whole chicken in my Instant Pot! With a family of 8, the Instant Pot is a Savior. The fuse blew on my first one, this is common from what I read. Beware, do not overheat your IP. They replaced it though, no charge. I always set it on saute and brown my chicken first, about 5 minutes on each side(makes it’s own juice) then I pressure cook it. I use a 2 types lime marinades, chicken broth(instead of water)butter, garlic, onion powder, chicken rub and an onion. My family loves it! I have an 8 qt, sometimes I cook 2 small chickens. Makes great chicken salad. I am with you Holly–the Instant Pot makes INCREDIBLE chicken!!! And I love that you browned the chicken first–great idea! I have a recipe for honey lime chicken marinade that I am going to try ASAP for my IP chicken. Thanks for the idea Holly! Take care and happy pressure cooking. Can I throw carrots and slices of potatoes in with the chicken like I do while baking chicken? Hi Becky! You COULD place potatoes and carrots in the IP with the chicken, but they would get really soft in the time it takes to cook a full chicken. What I would do is cook the chicken as directed. Do a quick release after 10 minutes and let the chicken rest on a cutting board tented with foil. Then I would add 1-2 inch carrot chunks and potatoes to the chicken juices left in inner pot and cook those on high pressure for 5 minutes. Let NPR for 3-5 minutes then manually release and serve with your chicken that will still be warm. Enjoy! Thank you for sharing your success Tracy!! I love this recipe SO much and I am so glad you did as well! Quick question: What to do with remaining liquid? Use as a rich stock? Or is there some reason not to use it? Thanks! You can absolutely SHOULD use the cooking liquid to make a rich stock. It will be heavy in fat, but you can strain it or cool it and skim the fat off, or just go ahead and use the rich stock. Amazing tutorial!! I’ve had my Instant Pot for almost 2 years now and have never attempted to cook a whole chicken in it, so this is just what I needed! Who knew the Instant Pot could make such a delicious chicken?? Oh I am so glad this helped you out Sues! 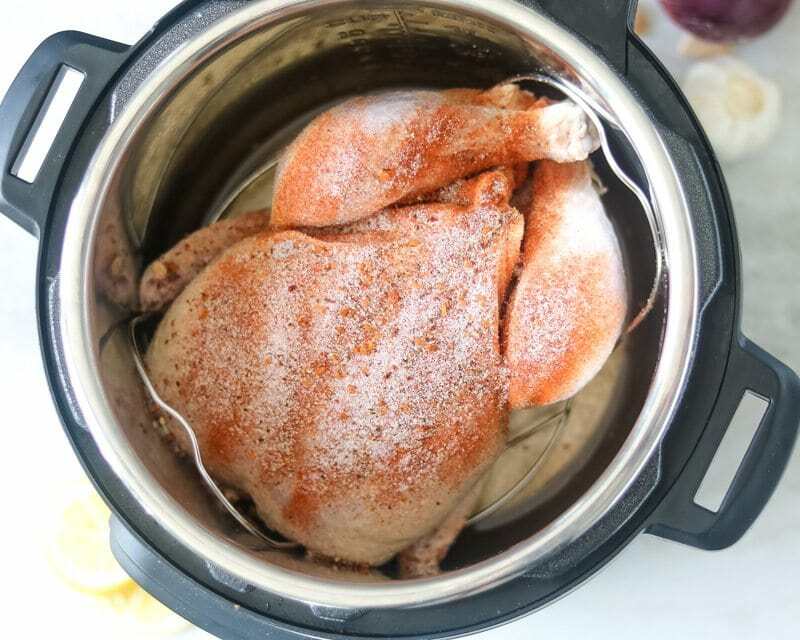 I have ALWAYS had such trouble with the whole chicken in the Instant Pot – maybe I should have had you teach me before I tried it out! Could I successfully cook two whole chickens (3/3.5 lbs each) in my 8-qt IP? How would the directions need to be changed? Thank you! Hey Stephanie! As long as you can fit both chickens in your instant pot on the rack and close the lid, you can cook BOTH chickens and timing will be based on the largest chicken (so you don’t need to cook for 7 pounds total–but 3.5 pounds) and that would be for 21 minutes on high pressure. Enjoy! I just started this in my IP for our dinner tonight! I am excited to see how it turns out!! It was super easy to put together! Probably going to be a regular recipe around here! Oh I sure hope this does become a regular recipe at your house. We love it here. Enjoy Lisa. I made my first Instant Pot whole chicken today and it came out perfect! I did use salt and pepper instead of the Rotisserie seasoning and it is very tasty. I love your narrative as much as your actual recipe. I made your chicken stock right after and it came out great too! Thank you for your awesome recipes. Good Morning Esther! Nothing makes my heart happier than to hear how others enjoyed my recipes, so thank you for sharing. I also love hearing you enjoy my writing, I love letting you all in my life through these recipes. Take care! Oh my gosh. I have only had my IP a week but I am in love! Made this whole chicken recipe last night and using the rich broth to make a sausage and bean soup today for dinner. Waiting on my mesh steamer basket so I can do my first batch of bone broth in it. I have always used my stove top pressure cooker for making bone broth and then emptied into another pot through a colander, then run that through a mesh strainer, etc! This IP is going to eliminate so many extra steps and extra cleanup. WTH took me so long to buy one, lol. I made this last night, and it came out alright, but I will definitely have to attempt it again. My chicken was 5 pounds, and I cooked it for a full 30 minutes, allowing the pressure to release naturally for about 15 minutes. The bird was very tender and juicy, but the breasts were slightly under cooked. I ended up finishing those off in the microwave because it was getting late for dinner. Now, here’s the kicker: My husband doesn’t like juicy meat. The dryer the better for him. Ugh! Regardless of his preferences, I’ll attempt this recipe again. I have to say, I had high hopes finding this recipe. I am disappointed though. Cooked a 4 lb. chicken for 24 minutes as the recipe called for. Let it release naturally for 20 minutes. The breasts were still raw. The chicken wasn’t tender at all. It’s past our dinnertime, but trying to cook it a little longer in my Instant Pot. Hopefully it will taste okay. Oh man Jo Marie! I hate hearing this did not live up to your expectations. I am wondering if your chicken was partially frozen? I have been noticing lately that a lot of whole chickens have been previously frozen and not fully thawed when sold. That definitely would change the cook time–as 24 minutes is more than enough time to cook a 4 pound chicken. I hope that you were able to cook for 5-10 more minutes and have it taste good for you. Sorry you had to wait–that is never fun! Does this chicken reheat well the next day if it’s not all finished in one sitting? It looks amazing and I can’t wait to try it! Hi!!! Yes, this chicken reheats well the next day. You can place on broiler pan and crisp up in oven and enjoy. Or place back in IP with 1 cup chicken stock for 5 minutes and enjoy that way. I also like to shred the meat and use in recipes as well. Enjoy! I have a 5 lb chicken. After I cook it for 30 minutes, do I immediately press cancel and then wait 20 minutes to take it out? Or do I press nothing and wait 20 minutes and then take it out? The manual says there is natural release and a 10 minute natural release (which I would wait 20 per your instructions) which seem the same to me so I’m confused. Thanks! I am definitely trying this. If I make it in the morning before I go to work so my family has dinner before I get home could I keep this on warm? If I kept this on warm for 6-8hours would that be to much and fall apart? Any suggestions? Hi Donna! The Instant Pot will hold your food warm for up to 10 hours, so it will be SAFE to cook BEFORE work. It may be a bit more tender, and may fall apart, but it will still be oh so juicy and tasty! Enjoy! I’m confused. First you say to use the max fill line (exception to the rule) then you say to add one cup of water. How much water do I put in the Instant Pot to cook a whole chicken? I’m an Instant Pot newbie so I’m a little intimidated already so don’t want to burn something up. Hi Marty! I am sorry for your confusion. You fill to the max line if making STOCK at the same time you are cooking your chicken. If you just want to cook your chicken–use only 1 cup of water. Thanks for the easy to follow the recipe for the roast chicken. I also do not eat the skin. Do you still need to use the rotisserie rub? Hi Tony! I actually would rub use the rub still to add flavor–or even better, rub the blend UNDER the chicken skin (I do this with plastic gloves) Enjoy! I tried cooking a 6lb roaster for 36 min with the natural release and when I went to cut the leg off it was still a little bloody and not falling apart. Not sure why this is. Putting it back in for another 10 minutes and see if that helps. I am so sorry for that issue. My only thought is that the chicken was not fully thawed out…some fresh chickens have been previously frozen when sold at grocery store. If you used hot water instead of cold water that can alter timing as well. I hope it was perfect after the additional 10 minutes. Why would hot water slow the cooking down rather than speed it up? Hi Chris, hot water causes the pressure cooker to reach pressure faster, therefore it speeds up pressure time, but then you would need to add more time to the overall cook time to ensure the chicken is cooked through. It always works best to start with cold water for even cooking. Hi Deanna! I would use the extra liquid to flavor dishes like rice, soup, quinoa, etc. Just use like chicken stock. Or use that liquid and the bones to make really good Instant Pot Chicken Stock. It came out wonderful. I am making a stock now that I have stripped the meat off chicken. Thank you for this easy easy way to cook chicken. I didn’t want to have to brown it, etc. Oh Joy, I am so glad you found this recipe and had success. I really want my IP recipes to be easy to follow and of course delicious. So grateful you shared your success. This is my go to every time! Lots of great recipes on here! Sounds great. I am just diving into using mine. Question. If I smoke my check in a couple of hours and want to finish it in the instant pot, how long do you think I should pressure cook it? I was thinking maybe half the time. Hey Mitch! I love the flavor smoking adds to meat. I would check the temperature at the point you start pressure cooking. If around 100 degrees I would cut the time in half (3 minutes per pound) if less than that, I would do 4 minutes. If over 115 degrees, I would do 2 minutes per pound. Once cook time is done, check temp. Worse case is that you would need to cook an additional 5-10 minutes verses overcooking your chicken! Enjoy! Hi Stephanie! The recipe states 6 minutes per pound if your chicken is fresh, 11 minutes per pound if frozen. Your package of chicken should tell you how many pounds your chicken is and then you would multiply that by 6. So if your chicken is 3 pounds that would be 18 minutes, and so forth. Hope that helps. Our son bought me an Instant Pot for my birthday, and this whole chicken recipe is my first attempt. It’s in the pot now and I can’t wait!!! Yum! Thanks for sharing your research and skills! I am an adherent to the AutoImmune Protocol, and with minor spice changes (no paprika or red pepper, but I successfully reintroduced black pepper), this is currently working in my Instant Pot as I type this. The IP is a new thing to me, and I was hoping to find a recipe for a whole chicken. This looks perfect! Can’t wait to take those leftover liquids and make a nice gravy with this, then use the carcass for a nice stock tomorrow. Hi Suzanne! I hope you enjoyed this recipe. I understand dietary issues and so finding a recipe you can make is a HUGE blessing. Enjoy! Just made this with a few changes. I used white wine instead of water, and threw the neck and bay leaves in the bottom for flavor (figure I’ll make stock with it later). Didn’t have regular paprika, so I used smoked and didn’t have lemon so I used apple. Barely fit half the apple and tiny lemon in my 4lb bird, but still delicious!! Make sure to get the rub under the skin too. Wonderful and simple recipe, which I follow almost to the letter, plus crisp the skin in the oven afterwards. The chicken (which I buy from a local farm) turns out delicious, moist and perfect! The only variation I make is that I instead of regular paprika in the rotisserie seasoning, I use smoked paprika (the only kind of paprika I have on hand). I think the smoked paprika adds an extra depth of flavor. The recipe calls for enough rotisserie seasoning to fill an entire standard 2-oz spice bottle. I only use a fraction of it on my 4-lb chicken, and save the rest as a wonderful seasoning salt to use in other dishes! Florian I am so glad you enjoyed this chicken! And smoked paprika is a delicious swap! The spice mix smells lovely. The instructions were very detailed, which I appreciate. However, my 5 lb chicken was not done, not even after 35 min high pressurized cooking and 25 min natural steam release. It’s still bloody and extremely watery. I’ve just put it in the oven to continue cooking. I am so sorry you had issues with your chicken. Your Instant Pot was not sealed fully. You used warm water instead of cold water in your pressure cooker. OR (and this is a common issues) Your chicken was not fully defrosted when you cooked it. Sometimes chickens take forever to cook defrost or when you buy one from the store they are partially frozen so you don’t realize they are still partially frozen. And that can nearly double your cooking time. but for some reason after the cooking time it naturally depressurized in under 10 minutes, rather than the expected ~20 minutes. The breast was still raw inside. Was the chicken supposed to be room temperature? Hi Michelle! I am so sorry for your issues. It sounds to me like your instant pot was not fully pressurized (even if it appeared fine). Next time, be sure your chicken is FULLY defrosted (or use frozen chicken times) and that your seal is fully secured and your vent knob fully pointed to sealed position. For now, you can put your lid back on on and cook on high pressure for another 8 minutes. It shouldn’t take that long to reach pressure for 2nd time. Approximately how long would you say it will take a 3lb chicken to come to pressure in a 6qt pot provided the chicken is fully thawed? Hi Jill. It typically takes my 6 quart about 10 minutes for a 3 pound chicken that is thawed. Hope you enjoy. The taste was FANTASTIC… but there was absolutely no crispy skin… It fell off like I was making chicken and dumplings. I followed your recipe but I was using my Instant Pot Duo Mini(3quart) and a 4 lb chicken. This might be my first Instant Pot Fail. Hi Tim! I am sorry you considered this your first fail. First of all, I am surprised you were able to fit a 4 pound chicken in a 3 quart mini. My thought is that to fit it in there, you did not have your chicken on a rack, which would have made the chicken meat absorb the water and make it very moist and fall apart. Secondly, I state that for crispy skin, you need to broil in oven for best results. Sorry for the hassle, but at least the chicken still tastes good. I tried this tonight on an unfrozen whole chicken stuffed with lemon and onion. I put old bay seasoning on the outside because it is my sons favorite and thats who I was cooking it for. I made a 5 lb. whole chicken at high temp for about 31 min and i let the pressure slowly release afterwards. The chicken was moist. Personally, I will brine the chicken first before cooking it again this way to add more flavor. Great recipe, thanks for sharing! Have you tried this with a frozen chicken? Wondering how much cooking time I would need to add. This would by my second thing cooking in my IP. The first being boiled eggs LOL. Still trying to figure out the whole cooking time thing. I am notorious for forgetting to get frozen meat out for supper. You would need to increase time by 5 minutes per pound, for a total of 11 minutes per pound and for frozen chicken, let pressure release for at least 20 minutes. Would this work with stuffing in the chicken? Would the times need to change? Hi Susan. I don’t stuff chickens because typically by the time the stuffing is cooked through, the meat is over cooked. If you were to stuff this chicken, be sure to place in pan so the cavity is pointing up, so the stuffing won’t fall to the bottom of the instant pot and check the temperature of the center of the stuffing. I appreciate your adding the nutrition information per serving. But…. how much is considered a serving? I tried this recipe last night. The seasoning was excellent, but somehow a 4.78 lbs chicken was not done after 29 minutes of cook time and a 20 minute natural release. It was only at 145 degrees. I did an additional 10 minutes and a 15 minute release and it was great. Any thoughts on timing? Thanks! Hi there! So sometimes even fresh chickens are previously frozen and so it is possible the chicken was not fully thawed before you placed in pressure cooker. My best guess is that was the case, or that the meat was excpetionally thick in the middle. Glad you enjoyed the flavor. I’ll never buy a store made rotisserie chicken again! This was fantastic!! My chicken was 4.12 lbs and I could have cut the spices in half but this was my first IP recipe so next time I will do that. Tried this recipe tonight in a 5 pound chicken. Cooked for 32 minutes, but wasn’t quite all the way done. However, I realized that my float valve never popped up, and determined there wasn’t enough water in it. So, I put it back in the intent pot for 12 min with another cup of water, let it naturally release pressure, and it was perfect. Next time, I will probably put in 1.5 cups of water instead of 1 cup. Thanks for the recipe! There is a lot of stock left over after cooking the chicken. Can this be saved and used for anything? Looks like it has a bunch of good fats in it! I’m making this for the first time. I’m wondering about the people that ended up with raw chicken, if they counted the warm up time as cooking time? That could be. But I really think it is that it is more likely the chicken was not defrosted or thicker through the cavity. But yes, my timing refers to cook time only! Enjoy! Hi Brent! Yes, my directions state if you want to crisp up the skin, place on a baking sheet and brush with oil. Broil until crispy. Also, I use the handles on my trivet if I can reach them or two carving forks to help get out of pressure cooker. Excellent! This was only the third time i’ve Used my instant pot and it came out perfect. I tend to like drier chicken because i’ve Never been able to make tender but juicy chicken before. But this came out very tender and very juicy. Thank you for this simple and perfect recipe. Going to try the lasagna soon! Hi Elizabeth! I love that you were able to enjoy juicy chicken and enjoyed it! I hope you enjoy the lasagna as well! Hi, can you please clarify/explain the logic behind why you say a chicken WITHOUT gizzards requires MORE time to cook rather than less? This doesn’t seem to make any logical sense.. (You stated: “If you have a chicken that comes without the gizzards or plastic clamp around the legs, you would need to increase time by 5 minutes per pound, for a total of 11 minutes per pound..”) Thank you for your help! This turned out really good!!! I followed the instructions exactly, and it was juicy and falling off the bone. I put it in the oven on broil to crisp it up, which ended up drying it out some. I had it in for four minutes, but that may have been too long. Delicious!! EXCELLENT. I wanted plain chicken to use in recipes during the week so I did not season or saute (I don’t care about the skin) and this came out perfectly! I’m going to use the bones and leftover liquid for stock, which I can use in other IP recipes. Thanks for clear and practical instructions. Hubby and I just finished our whole chicken in the instant pot. The lemon and onions gave it an amazing flavor. It was moist juicy and absolutely perfect. I am saving the broth for another day I just couldn’t throw it out it was so perfect tasty. I followed your directions exactly except I made it a little spicier. I had a little chicken left on the serving dish my son stop by and slowly picked away at it until there was none left he loved it. Good job thank you so much. Picked up my first Instant Pot today. I had a chicken ready to oven roast for dinner. Googled recipes for the Instant Pot and here we are! Your rottiserie seasoning is perfect. The cooking times and instructions are perfect. I cooked a 7 pound chicken in my 8 quart Lux to perfection. Way to go Tracy! Most people buy the instant pot and let it sit for a long time because they are too scared to use it! I am so happy you found my recipe and it was a success. Here is to many more Instant Pot recipes!! Do you use the entire spice blend for one chicken? I am trying this right now (kitchen is smelling good!) and put the entire spice blend on the chicken, but it seemed like a lot of spice blend. Hoping I didn’t just over-season and ruin a whole chicken! Thanks! Hi Robin! I make the spice blend and then use just what is needed to liberally season the entire chicken. Even if you used too much, just discard the skin, the meat will be fine. I also put all of the spice seasoning on the chicken. I thought it seemed like a lot, but I read back through the recipe and figured that must be what I was supposed to do. The chicken is moist and flavorful. I take the skin off anyway so it was not an issue at all. I have only had my Instant Pot for a couple weeks and I’m determined to make good use of it. I was heading to the store to buy a rotisserie chicken today and decided to first see if I could cook a whole chicken in the Instant Pot. Obviously I can. Thanks for showing me how to do it. I’m typing this with a very happy mouth full of chicken. Thank you thank you thank you for this delicious recipe! YAY!!! So glad you are enjoying! Can I stuff a chicken and put gravy instead of water.? Hi Jeaninne! The stuffing inside the chicken will probably get fairly soggy as the chicken is cooked with moist heat, it also will take longer to cook the chicken, which may dry out the meat. Ad for gravy, no, you need water or chicken stock–and then can make gravy after cook time with drippings. The gravy would cause a burn notice to occur on your instant pot. Sorry it can’t work out the way you were hoping. I am just wondering if it is ok to use 2 cups of water since I have an 8qt pot and it says to never use less then 2 cups with it and you also said that you used a 6qt. Hi Juliane! I would use at least 1.5 cups for an 8 quart but 2 cups works great too 🙂 Enjoy! Hi Kate! I am sorry for your issues–very frustrating. That seems EXTREMELY quick for your pin to drop with a full size chicken. Did you use a full cup water? Was your chicken only partially thawed? Let me know and I can help further trouble shoot for you. Thank you for sharing this recipe!! We had a 6lb chicken that had to be cooked and had just received an 8 quart IP as a gift. Your instructions were dead on and SO helpful since we are new to IP recipes. We let ours sit on keep warm for 20 minutes after it finished because we weren’t sure exactly what natural release means… It came out moist and delicious so I think that worked just fine. We be making your IP broth with the leftover bones and bits tomorrow. Can’t wait!! Thanks for saving our chicken dinner tonight it was a great success!! Recepe came out perfectly. I did everything exactly except for put anything inside the chicken. Next time ill try putting the lemon and onion in chicken. The chicken was so moist. It was a hit with my hubby!!! Great tip–I am going to have to give that a try. Thanks for sharing Jo! This recipe was great! My family loved it. I ended up doing a 6.2 lb chicken in my 6-quart pot for 40 minutes with a 15 minute pressure release. Everything was done to perfection. I made gravy from the juices afterwards using the saute setting. The only thing I would change is that I think you only need about half the amount of the spices listed. I used most of the amount listed, but it became rather gloppy on top of the bird. Thank you for sharing!